I was given this plant a while back and it had not been taken care of. It had been overwatered and too much light. It is coming back. From what I’ve read this plant comes from Madagascar. On June 8th I posted a picture of what I thought was Machairophyllum latifolium, I was led to believe that from the label on it from the greenhouse. My cursory examination didn’t catch it but luckily a reader by the screen name of Arizona Ed (or CactiEd, not sure. Email me!) did. I appreciate it. It is in fact Rhombophyllum dolabriforme commonly known as Elkhorn Plant. Thanks for the correction. I’ll try harder in the future. This has nothing to do with Succulents but I started using Windows Live Writer to write my blog entries. It is a wonderful tool that makes blogging easy. If you blog it’s a must have. Check it out. 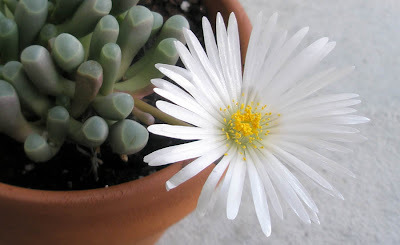 This South African succulent has pebble-like leaves and is a winter grower but given water in the summer it can adapt. This plant will form a dense mat of clustered heads. I expect yellowish-brown flowers in the Spring. I really like this plant. It has no common name and I can’t wait for it’s flowers of orange and red. 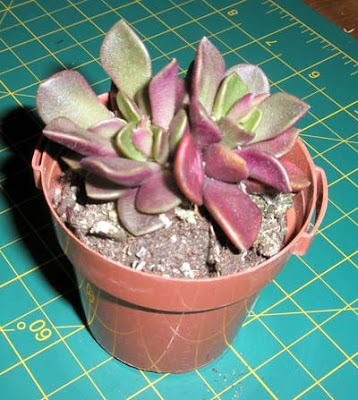 I found this plant a few days ago at the local Lowe’s big box store and it is exactly what I”m looking for in a succulent. Thick pointy leaves in tight rosettes. Haworthias are native to South Africa and from what I read this plant goes dormant in the summer and are winter growers. I’m looking forward to seeing it’s small flowers. Echeveria runyonii is found in Mexico and is fast growing. I came upon this specimen and look forward to it’s offsets. It’s obvious looking at it why it’s called Topsy Turvy. I’m looking forward to the bright orange and yellow flowers at the end of summer. It’s a beautiful plant that I will be sharing. Anyone who knows me or knows this blog knows I love succulents. But my true love is the Lithop. I pulled out all of my Lithops for the first time today after a long winter. The become dormant and die off and a new plant emerges out of the center. The hard part is not watering them. I've barely watered them since October!!! I was a little worried as many of them are very small., just babies. Faucaria tigrina is one of the more interesting succulents. 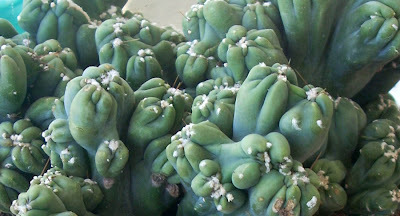 It has rosettes of triangular leaves with pointed fleshy parts, making them look like open jaws. It is one neat looking plant. Mine is nice and pink whereas most of the Tigers Jaw that I have seen have been a rich green. I assume that makes it Faucaria Tigrina Felina. This is another plant from South Africa. I plan on separating this and adding it to one of my dish gardens. 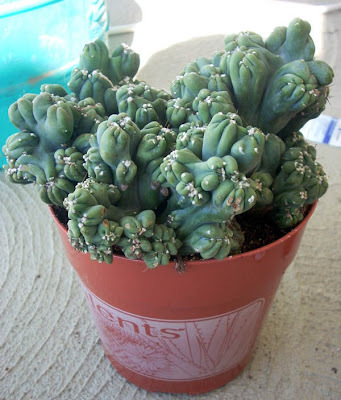 Back in the beginning of August, A Succulent Obsession had a photograph of Crassula Gollum that I found fascinating. I had never seen one before. On the site they called it Coral but I've seen it called Hobbit's Pipe after JRR Tolkien's character since the leaves are tubular and appear to be tipped with a suction cup. It is also known as Trumpet Jade or Finger Jade. I searched high and low and finally came upon a nice specimen. As you can see when the plant gets sufficient light the tips become red. As with any of the Jades it is easy to propagate. I plan to mix different jades into a dish garden. I think that will be interesting. I wrote a few days ago about my Jade Plant . Jades are beautiful in their deep rich greens. There are many varieties of Jade so I started collecting and propagating some of them. I found a variegated Jade (crassula ovata variegata) at a greenhouse and it is a beauty with thick variegated leaves of green, white and pink. Take a look. 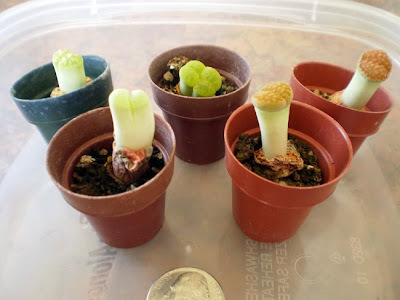 Remember how easy these are to propagate using leaf cuttings. Let the leaf sit in the sun for a couple days until it forms a callous and then plant in soil. Make sure the soil is fifty percent gravel or perlite. It needs to be able to drain easily and water when dry. It's that easy. Now this is a great succulent and a real attention getter. Beautiful thick leaves with rich maroon streaks throughout and outlining the leaves. I just got it and it's going to be a nice addiction. I plan to display this in a simple terracotta container and have it in front of a plain wall. People who know me know that I love succulents. Many times at work or on a special occasion someone will give me a cutting or a full plant in a container. Lately I've been the recipient of odd plants and plants that are near death. 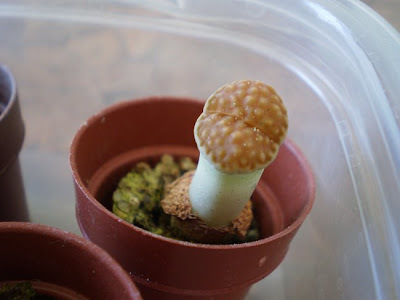 The coral cactus was given to me just because it was so odd looking. This plant is Euphobia Lactea Crest and as you can see it has been grafted onto another Ephobia. In the wild the crest is rare but with breeding and propagation techniques they are easily found. The Euphobia Lactea Crest is grafted onto the Ephobia to speed up it's growth. I've been told they do this in Thailand. I'm not really into Cacti. Repeat after me, All cacti are succulents but not all succulents are cacti. I have some and enjoy them but there are endless varieties of succulents to discover. The Coral Cactus, though, is a beauty and I'm looking forward to seeing it flower. I originally posted this pic on other site and realized it made it look larger than it really is so I took another picture with a yardstick to show how large it really is. The last plant I wrote about was a monster so I decided to look at one that is the opposite. Anacampseros telephiastrum variegata is a beautiful little plant. 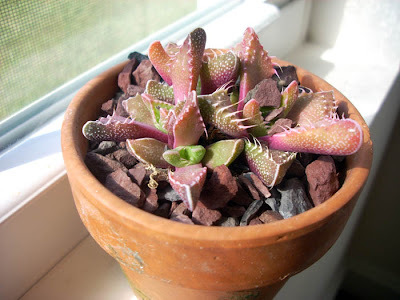 I wrote about this plants cousin, anacampseros rufescens a not too long ago HERE . This is a much smaller succulent but given sunshine it is truly beautiful in its' pinks. I didn't get this too long ago and already it's responding well. Small white hairs grow out from it's stem. This one hasn't flowered yet but from what I've read I can expect a small magenta flower. I've never been a big cactus person. I love succulents but cacti in general never really excited me. 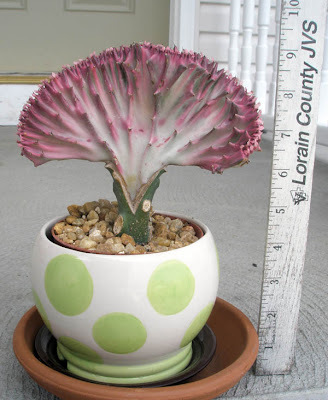 It' important to remember, All cacti are succulents but not all succulents are cacti. A while back I saw this cactus and fell in love with it. 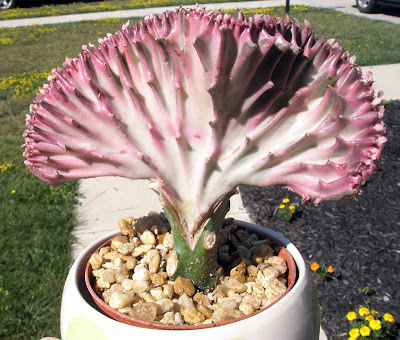 It is so ugly that it's beautiful I believe it is Cereus peruvianus f. monstrosus, from South America. A couple of years ago one of my friends gave me a cutting of a Ghost Plant (Graptopetalum paraguayense) that has grown into a real beauty. 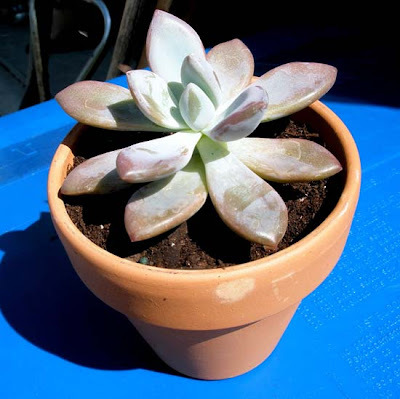 The Ghost Plant is native to Mexico and is also known as the Mother of Pearl Plant. 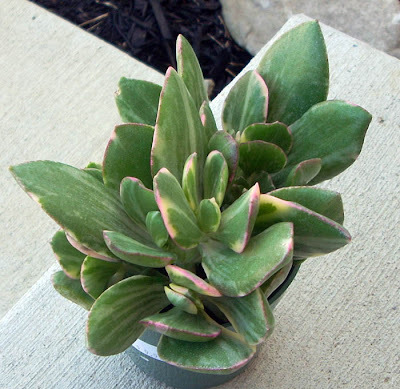 The plant has gray rosettes with a purplish undertone. 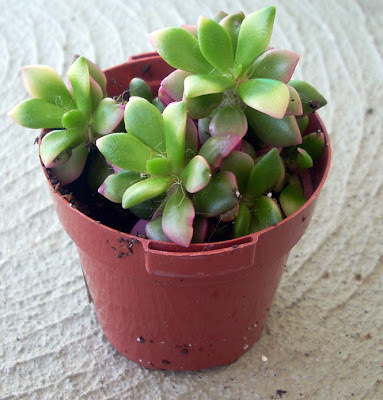 It's a member of the crassulaceae family that includes the popular Jade Plant. This plant is incredibly hardy and wants to be left alone. If handled too much the leaves will drop off. 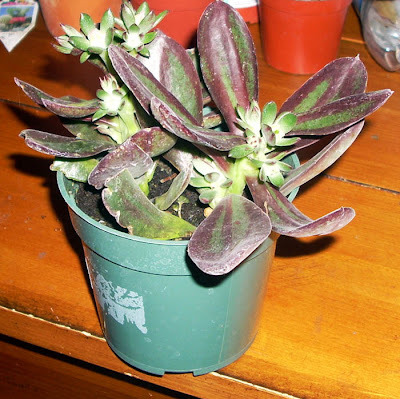 This isn't that bad of a thing as the leaves are easily propagated by just laying them on damp potting soil and you'll have a new Ghost Plant in no time. I've been expecting it to bloom this summer with small white flowers. I'm still waiting. 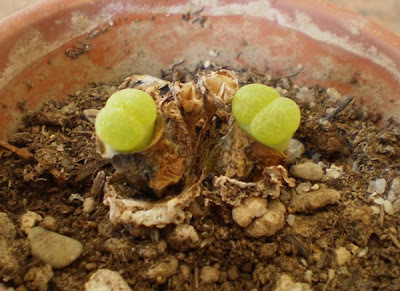 Anacampseros rufescens is native to South Africa and grows to about 3 inches in height. It's ideal for a dish garden and right now I'm trying to decide what other succulents to plant with it. It hasn't bloomed yet but usually does in late Spring or early Summer. It will have purple-rose colored flowers about two inches high. I haven't smelled one but I've heard they are mildly fragrant. I'll be coming back to this plant later, it's a beauty. 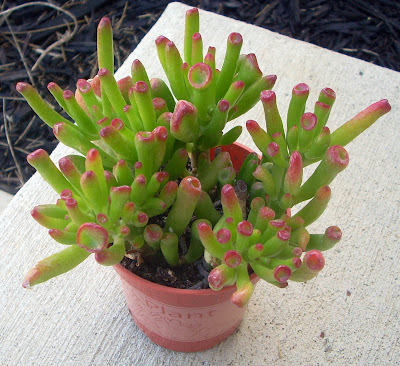 Crassula ovata is probably the most common houseplant of all the succulents. It's also known as Friendship Tree. I've heard people call it Money Tree but that plant is actually Pachira aquatica. 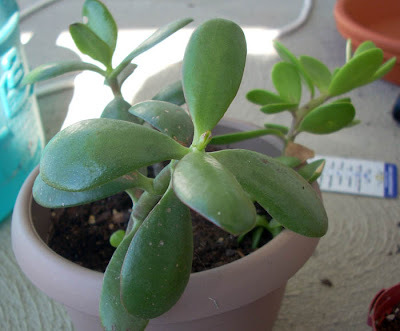 Jades have rich green leaves and are great for creating an indoor bonzai. I got mine from a friend whose plant is over four feet tall. Her crassula has flowered beautifully with white star like flowers. Jades are incredibly easy to propagate. Just take a leaf off, let it dry, and then plant in damp soil. It won't be long before it will root. Labels: Crassula ovata, Friendship Tree, Jade Plant, Money Tree, Pachira aquatica. It seems like every time I write about one of my plants I say it is my favorite. I can't help it. I find these succulents fascinating! Split Rock is also know as Cleft Stone and Mimicry Plant. 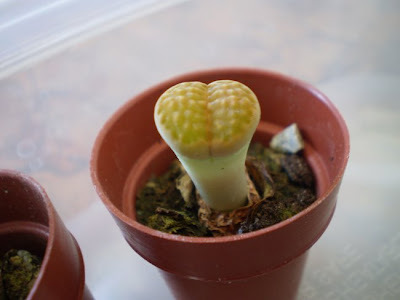 It's scientific name is Pleiospilos nelii and it is from South Africa. I have a friend in San Diego who grows this in his rock garden but obviously it wouldn't survive Ohio's harsh winters. 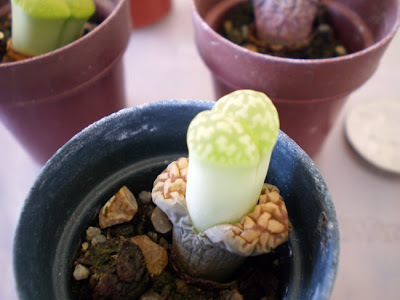 My friend thought that it was a kind of lithops but it isn't. 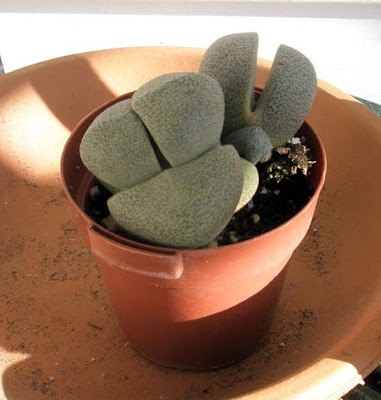 Lithops are odd plants that grow buried up their tops but Split Rock sits on top. Plus Split Rock will have multiple flowers. The main problem with this plant is it demands so little attention. I've read where in a European environment a mature plant can go an entire year without being watered. I water mine lightly and infrequently and so far it is doing quite well. I'm hoping for flowers before too long. 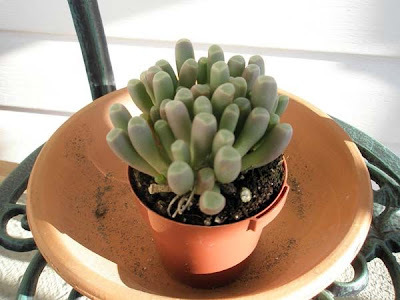 One of my favorite plants is Baby Toes, Fenestraria rhopalophylla. It too is native to South Africa and what makes it interesting is that the top of the leaves have a window to allow light in. The photosynthetic tissue is located on the inner surface and not exposed to the extreme conditions, so no loss of water into the atmosphere. In the wild the plant is covered with sand and only the leaf tips are visible. This is another plant that is easy to grow as long as you don't overwater it. Baby Toes produce large yellow flowers on long stems. After having the plant for a few months I was surprised in the middle of summer with three flowers. They are reminiscent of daisies but very shiny. Baby Toes should be a part of every succulent collection. All images and text copyright 2008.